Carol Field's 'Italian Baker' is the oldest book in my ever growing collection of books on bread and pastry making, and still one my stand-bys that I refer to often. 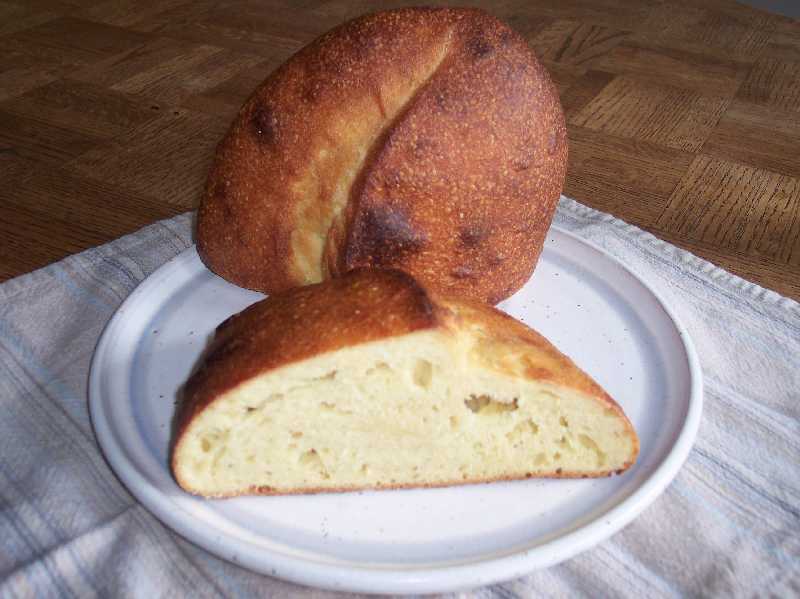 One of the breads included in her chapter on regional and rustic breads is the Altamura bread from the town of the same name in the region of Puglia. The bread is one I've wanted to make for many years but have never run across a local source for the type of durum flour needed to make it. Finally this Spring, as some folks may remember from previous posts to this blog, I was able to have some shipped from Giusto's in San Francisco to my home on Vancouver Island. A bit of an indulgence as far as the shipping costs involved and not one I'll be repeating anytime soon. After reading through this document I decided to try and follow the authentic formula as much as possible rather than using Ms Field's recipe, which she describes as an "Altamura type" that uses a biga instead of the traditional natural leaven called for in the DOP formula outline. Developing an active durum/semolina flour starter from scratch takes a little less than 48 hours I discovered. Natural yeast just gobbles up the available nutrients of durum at a rate I've never seen before with other grains. This fact has been the biggest obstacle to me in trying to achieve a reasonably acceptable loaf, simply because the starter or the leaven was reaching it's peak long before my sleep and work schedules permitted me the time needed get a mix going. The first mix I made was pretty much a disaster and needed to be rescued with baker's yeast, the second and third attempts had slightly better results but still not great. This last attempt, while not a home-run by any means, is the best to date in terms of the final shape. This one has a much better flavour than the last three as well, but the crumb is not as open as I think it could be and the crust is not at all crusty. The original formula indicates a 60% hydration level, however I increased this by 9% as the dough was a little stiff for my liking. This, along with the fact I used steam instead of baking with the oven door open for the first 15 minutes as indicated in the DOP procedure,was likely a critical error on my part towards achieving a proper crust. Old habits die hard, so I've highlighted that part of the procedure in my notes for the next attempt. Regardless of the fact I've only had what I'd call marginal results with this project so far, I am enjoying the challenge of trying to reproduce this ancient and venerable bread. This bread was on my "to bake list" for a long time but got lost. I was going to use Leader's formula from "Local Breads." Your current attempt looks pretty nice, but the crumb is surprisingly dense. I just got a copy of "The Italian Baker." I should compare the versions of Pane de Altamura in Leader and Field and check my other books for formulas. I'm going to give this traditional, naturally leavened version a few more tries to see if I can achieve the bread using the formula set out in the EU D.O.P. document, but I've little doubt that Ms Field's formula will produce excellent results. Until I acquired Hamelman's 'Bread', Field's ' The Italian Baker' was the most reliable book of bread formulae in my collection. I hope you'll enjoy the book as much as I have. The crumb is much more dense than it should be, I agree completely. This durum flour is a very different medium to work with than typical wheat flour. The gluten content of durum is quite high, but of a lesser quality from the standard wheat flour we're accustomed to. Both Nico and Andy observed from the photos of the flour I sent them that the mill is quite a bit finer than what would be used in Altamura, and who knows what the difference is between the properties of the two. It has occurred to me that I may be trying to make a silk purse from a sow's ear in this pursuit, given the differences in seed, soil, and geography between our NA grain growing regions and what's grown in the specified area in Puglia. However I tend to think it has more to do with my position on the learning curve of working with it than anything else at this point, so hopefully future bakes will yield better results. All the best David, and thanks for your comments. 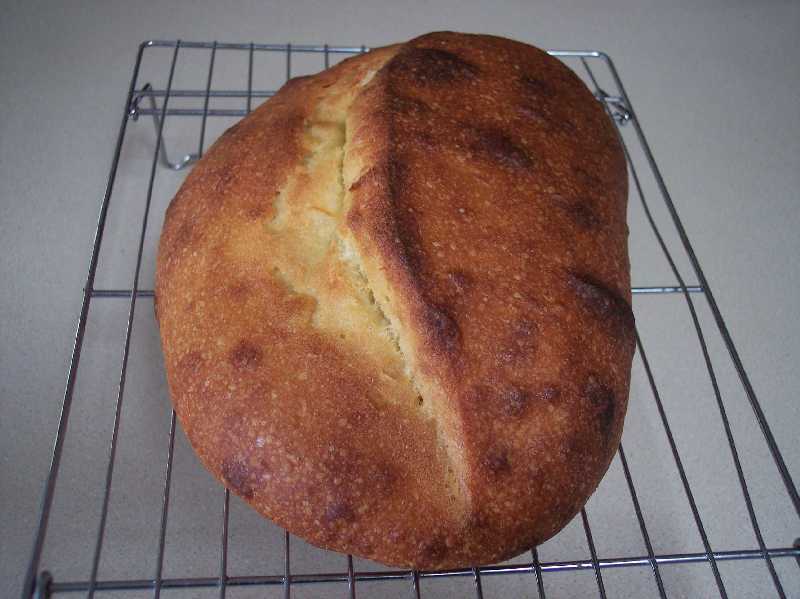 I did the very same thing last year, an Altamura-type loaf based on its PDO description. 60% hydration worked great for me, but then again, I can buy italian durum flour locally at the price that beats any mail order, and I bake a lot of low (as in below 60%) hydration breads. I would say that your dough does look too wet to my liking though. I was not won over by the traditional crust and ended up steaming - as one member here says "screw local tradition, it all about how I understand it". I never ever called my loaf Altamura, not even to myself, but I was pretty happy with the outcome. It was actually one of your comments to Andy/ananda regarding the proliferation of yeasted Altamura during the Borodinsky discussion the two of you had a while back that peaked my interest, initiated my research,.. ordering the flour and so on. Just to be clear, I will never consider any of my bakes of this bread to be anything more than a Pane Tipo Altamura ..at best. It's an interesting and challenging bread to make if you try to stick to the DOP regs, but I may end up going with what I know will work at some point as well. Just not yet. I think going with what you know makes total sense. I mean with a bread like this you can never really completely reproduce the recipe in your kitchen, but it's ok because whatever you do you are still closer to the original procedure and correct result than anyone who's ever written about Altamura, and that should make you feel good. and what a nice job you've done of shaping. The history of this bread is very interesting - thanks for featuring it. happy to have the opportunity to read it, as this is one of the cookbooks I picked up on our trip (the 'ever growing collection of books on bread' is happening here too :^) ). Mr. Leader remarks on the "reddish gold crust" and "sunny yellow crumb", and describes the shape of the bread as "pane accavalatto or 'overlapped bread'...shaped in an arc, like an orange section" - I think you've got it! I look forward to see your next bakes. Your post gives me the push to try the Altamura. I found this site of a mill from Altamura, with some recipes, including how to make natural yeast. Very kind of you Juergen, thank you! The link you sent is one that I ran across as well while doing some of the research for the bread, but I certainly appreciate you passing it on for anyone who hasn't seen it. It has some good information on it but I noticed that the recipe for Altamura is quite a bit different than what's specified in the DOP regulation. That's really the object of this exercise for me, to try and reproduce the bread as closely as I can by following those regulations.. within reason. All the best Juergen, and let us know when you try the Altamura. Franko, I agree that the crumb should be more developed, but you are on the good way. The hard part is getting the right feel for that terrible flour that seems to be thirsty like hell and after a while seems to release the water, not to speak of how delicate the gluten is (always keep a very careful eye at the dough: it tears!). My sicilian friends that bake durum wheat bread every day recommended me not to make the mistake to knead extensively the dough: they use a super-quick mixing with folds every 30 minutes. In practice they do a no-knead bread with much shorter times. You are so right Nico about durum being a "curious beast". I learn a little more about it each time, but as you say the feel of what is a good dough is tricky to get a handle on when the flour is 100% durum. This last mix was done by hand, as are most of my bread mixes. It did have a slightly longer workup than previous mixes, but only just. You wouldn't think a bit of extra hand kneading would make that much difference. As far as the dough tearing, I had a little bit of that in the very first mix and immediately stopped, as you had cautioned me about this in one of our PMs if I recall. This has been one those interesting and frustrating, but ultimately enjoyable learning experiences one runs across every so often. Thanks for your encouragement and guidance throughout! I love the crumb colour too, Franko. It also looks quite moist. The story is also interesting. I love history and how culture/tradition can also be seen through breads/foods. The nice yellow crumb is one of the highlights of this bread for me as well. When the photo was taken 4 days ago the crumb was fairly moist, however it hasn't retained the moisture as well as bread made with regular flour would. It still tastes fine and is great for sandwiches and toasting, but just on it's own I find it a little drier than I prefer. Glad you enjoyed the post and thanks for your comments. I'm in the same boat as you Varda, I've never eaten any of the real thing either. I've seen lots of photos and video of the real Altamura though, and I can tell you that the crumb on this one doesn't look anything like the ones I've seen. Not even close in my estimation. Something to shoot for though! Thanks for your good wishes with the project. Nice project, Franko and one I will be following closely. 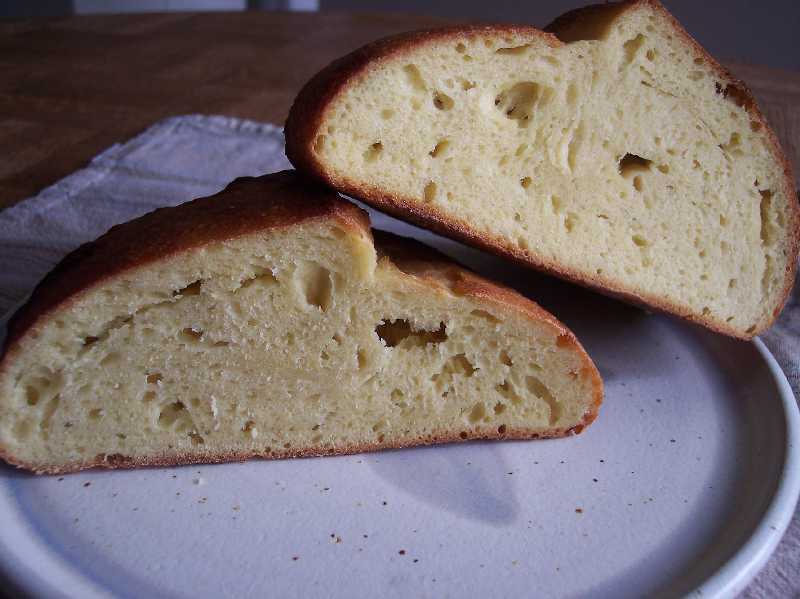 I have only recently started to bake with semolina and first tried Joe Va's Pane con Semola Rimacinata di Grano Duro. Actually, he has some really good info on that post about semolina in general and the flour he uses is from Altamura. His recipe calls for 60% hydration and I suspected it was going to be too dry the minute I first saw that recipe. And, although I did increase the hydration to 63% and later to 65% I got a very open crumb with both the 63% and 65% hydrations. In retrospect, I think it is possible to get a really decent open crumb with semolina at a 60% hydration (Joe Va certainly did). Pane con Semola Rimacinata di Grano Duro is 60% semolina and 40% bread flour. He might have been using a bread flour with a lower water absorbtion rate than I did but I suspect I overkneaded it and could get that open crumb if I tried again at 60%. He uses miminal kneading: 10 stroke stretch and fold, repeated three times at 10 minute intervals and then one fold during the bulk ferment. I would also be easier to get a crustier crust with a lower hydration. Anyway, just something to consider. Thanks for your comments and input on this project Syd, much appreciated. Of course the main difference between Joe Va's loaf and the Altamura is the Altamura is 100% durum flour. Therein lies the challenge for me in trying to achieve a loaf with more open crumb and a truly crusty exterior, by following the D.O.P. regulations which stipulate using all durum in the formula. At first it was a case of wanting to know what the bread would taste like, but now that I have a pretty good idea of what to expect from it flavour-wise, it's a matter of trying to produce something that has all the other characteristics of Alatmura bread, or at least as close as I can manage. Thanks for your interest in this project Syd. When/if I make further progress with it I'll pass it on to you. Of course the main difference between Joe Va's loaf and the Altamura is the Altamura is 100% durum flour. I looked up the link you posted in the hope that IF (and that is a big if because I also want to try David's San Joaquin Sourdough and get a head start on the 600 other projects I have lined up) I get the time this weekend, I might give this recipe a try. It will also depend if I get the semolina in time for the weekend or not. Anyway, I have a few questions and was interested in how you interpreted the recipe. 3. the Mixing should take 20 minutes, using a kneading machine with mechanical arms. 1. Does that mean three builds? And the leaven is to be 20% of the semolina. So if I use 500g of semolina, then I should use 100g of leaven? 2. Did you follow the temperature recommendations? 3. That is quite a long mix, but perhaps that is because bakeries deal with large amounts. Thanks, Franko. This is a really interesting project. My apologies for stating the obvious, but I wasn't entirely sure the point you were getting at. Text can be an awkward thing to communicate in sometimes. In my case it's most times. I agree completely that lower hydration doughs can have open crumb, particularly if standard wheat flour is being used. 100% durum flour dough has so far been a different kettle of fish however. Loaves #2 & #3 were closer to 60% than the last one and they weren't as open. On this last one I used a 40 min autolyse which I hadn't done on the first 3 and I think it helped. No, I mixed it warmer by about 8C. Previous mixes had all been in the 18-20C range and never seemed to show much sign of Co2 building...so I decided to try and boost it by having a warmer dough. We're having a cool summer so ambient temps aren't helping much. I think the best answer to that is to read Andy's comments in his response above, but you might want to have a look at what I put in my latest response to David Snyder as well. I've more to tell you about some points I think are important Syd, but I'll have to leave it till tomorrow as I've run out of time. I do appreciate your interest and encouragement with this project Syd! You have given yourself quite a project to making a gorgeous Altamura. Especially, the flour being so dear for you to acquire. Your crust is a beautiful color and the crumb is so close to looking like the one pictured in the link you have posted. Duram flour is so touchy when it comes to mixing, one minute perfect the next it can turn to mush. Maybe working on that sweet spot of mixing will get the crumb you desire. Your so close...happy baking! 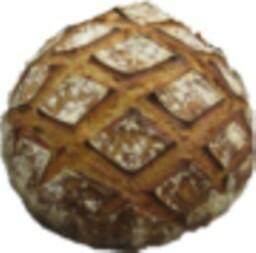 ADDED: [I used steam instead of baking with the oven door open] When you stated this about the door being open, it occurred to me that the ancient bread was baked in a wfo oven with the door off at the end of baking to crisp the crust. This site refers to the bread being baked in a wfo with oak wood used as the fuel. The site is 'Academia Barilla' http.//www.academiabrilla.com Here's another photo of the crumb...though not traditionally shaped, from the same site. The crumb shot is not as clear as from the site you have posted in your referred site, but appears very similar. Thanks so much for your comments and for sending along the photo! I really didn't think this post would generate as much interest as it has so I'm very pleasantly surprised with all the great information and suggestions everyone's been responding with. The crumb does look the same and if the loaf has been made using a natural yeast it's exactly what I'm aiming for in mine. Great stuff Sylvia, thanks again! I did see in the post that the bread is made with a natural yeast. I'm very much enjoying your post. I have some bakes planned with duram flour in focaccia. I've been very much into Focaccia for summertime. The bakery dates way back, they make the altumura bread in a wfo, show crust, crumb, wonderful shots, about the center of the video, and it's all in English! I came upon it while looking at the duram focaccia's in a wfo. Can't get the link to post..but just go to you-tube,' Bread from wood-fired ovens of Altumura.' I also loved the way he flips the focaccia, upsidedown back into the pan and oven. I grabbed a few minutes here and there today to do some searches on Pane di Altamura. From what I can gather, the crumb is dense but moist. Several sites remarked on its great shelf life - I saw everything from 5 to 15 days! I'm thinking this has more to do with the use of biga naturale than the durum flour. The photos I saw did not have a very open crumb. (If you have a link to the crumb photo you are using as your "target," I'd appreciate the URL.) Speaking of biga naturale, all the formulas I saw on the web use commercial yeast - obviously not authentic! This evening, I'm searching my books. 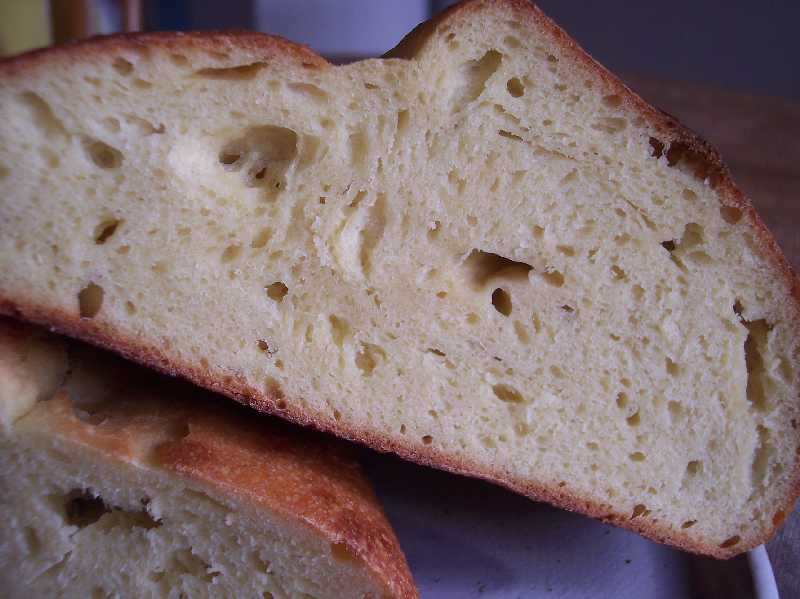 I know I have at least three with recipes for Pane tipo di Altamura. Above is a screen shot of the sort of crumb I'm after. If the picture doesn't come through clearly enough here is the link to view the page and player. It's on a flash player that loops continuously but if you right click on it when the pic comes up you can stop the loop to view it easily. I'm assuming that because this bread photo is featured on the site of the consortium that protects the integrity of the bread, that it's one made using the traditional method. As you can see, the crumb while definitely more compact than a typical wheat based crumb, is open quite a bit more than the one I baked. The one authentic formula I found on the web is the one in the EU D.O.P document. Unfortunately there's not much information regarding the mixing process used. In Ab&P P-151 regarding changes to the baking process using durum or semolina flour up to 100%, Suas says that "the higher level of protein requires more hydration and that the higher number of gluten chains require longer mixing time to properly develop gluten structure". Autolyse is also recommended, which is a step I used and neglected to mention in the post. This seems to be somewhat at odds with Nico and Andy's advice about a shorter mixing time, however if a 'short mix'/low speed method is used over a longer period of time I could see that working without having the dough breakdown, as long as the dough didn't overheat. I'm getting my head back into this project a lot more now that I'm back from vacation, not having given it much serious thought over the last 6-8 weeks until this recent bake and post. I'm hoping to do another bake of it early next week and I'll be sure to post the results along with some carefully taken notes. I think it was Leader in "Local Breads" that describes the Altamura bakers who use mechanical mixing employing a long mix at slow speed. However, what he specifies in his method is a long mix (10 minutes) at Speed 4 using a KitchenAid mixer. His biga is 81% hydration, and his final dough is 70% hydration, although he doesn't account for the water and flour in the biga in calculating this, so the real hydration is actually even higher. 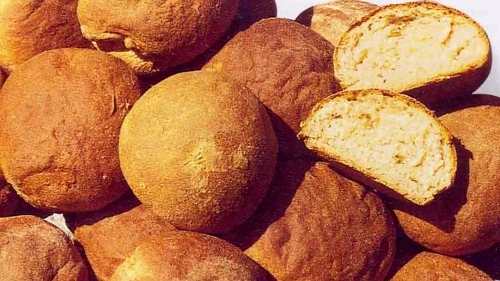 I've looked at the formulas in "Local Breads," "The Italian Baker" and the "Il Forneio" books. My gut reaction is that Leader's formula and methods are most likely to yield the result I would want. I say this having never seen or eaten Pane di Altamura DOP myself. and sorry for being a bit late to the party! I've been unwell for a few days, generally kept me out of circulation. I think you may want to reflect on Nico's sound advice about short mixing times, and low hydration. Clearly you have come to see the benefit of the short mix. I believe that is because the durum flour is very high in protein, but that protein is not of good quality. This probably also has something to do with the need to keep to lower hydration. I believe the mixers referred to by Syd are the Artofex type mixers with twin arms. They mix very slowly, with 25 minutes being typical mixing time. So the time specified is not high, and they are wonderfully gentle machines. For all that David admits to not having found an authentic recipe for this bread, I do think his comment about the crumb being dense and moist will prove to be accurate. That would surely be true to the nature of the flour, when used on its own in this sort of formula. In addition to your finding that the durum leaven ferments rapidly, I guess your dough may have become over-proved on account of the extra water you decided to add. Do you think that is the case? I hope you get it right next time. The shaping of the "cap" is great, and you have clearly picked up on all the important aspects in your research and practice. My apologies in return for not replying sooner than now. There are a number of things I've learned from this last bake and David's recent post of his Altamura bread. Keeping the hydration much closer to the specified 60% is certainly the first. During the initial mixing phase the dough felt quite dry, prompting me to add water, and although I think it did need some extra, apparently not as much as I gave it. The short mixing time Nico suggests I'm not sure of. 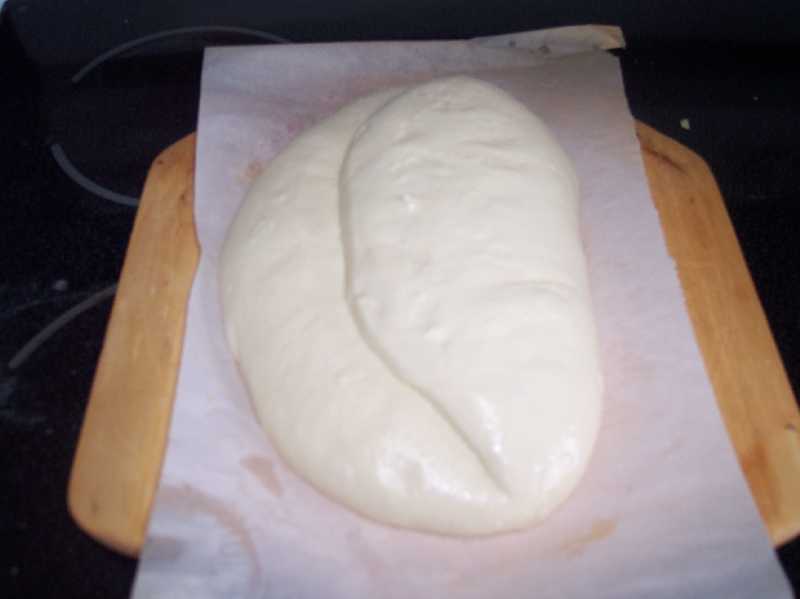 From what Suas says in AB&P a "short mix" or low speed mix is best for durum flour doughs, but the length of time required is longer in order to develop the gluten chains. Since I'm hand mixing, multiple S&F during bulk fermentation seem to be the alternative to this. Getting a stronger preferment going and keeping better temps during BF is the other key factor I need to improve. I've become a lot more familiar with the durum flour and it's fermentation cycle during the course of this project so hopefully the next one will be better still. This exercise has reminded me a lot of first learning how to work with high ratio sour rye breads with it's learning curve. Your advice and support during that experience were a great help to me then, as they are now. Glad you're feeling better Andy, and all the best. Yes David's post was excellent and offered a lot of learning opportunities. I believe you have now worked out a hydration level which is more suitable. I would estimate c.63%, from what you note in the post above. Regarding mixing, I completely understand where Nico is coming from, in warning about the danger of over-mixing. I would have thought that gentle hand mixing would be ideal to coax the best from the relatively low quality gluten forming proteins. However I would definitely agree with Suas that longer mixing may be required to get the best from the high level of protein found in this flour. I'm sure control of the pre-ferment is key; David was very keen to note that would be the area he would look to improve on if he repeats making this bread. Very interesting that Leader works with high hydration and high salt levels though, don't you think? I wonder if Leader's idea is to use a higher level of salt to help tighten the low quality gluten of durum flour, or if it's a matter of his own taste. It doesn't seem a significant amount in any case. If you look at the specs for water on the D.O.P. document it specifies a sodium content of less than 5-6 mg/l, which is fairly soft compared to the EPA average of 17 mg/l. Not having Leader's book...yet, I don't know if his formula is taken directly from the original he found in Altamura or if he's adapted it for using with NA durum flour. Hard to say what the reason is for the higher hydration level is, but perhaps it's connected with the higher salt percentage, as well as the NA durum. Too many unknowns and variables to know for sure. If I read the DOP document correctly, there are some interesting omissions- one being about the hydration of the pre-ferment. That's something I intend to play with when I get the time. The DOP doc seems to be a reference to certain absolutes in the traditional formula, so I imagine what is not specifically mentioned regarding other aspects of the formula would be open to the individual bakers interpretation if they were making authentic Altamura bread. Just a guess, but it seems reasonable. Altamura dough and high ratio durum flour mixes benefit from a higher acid content in the mix, so I would suggest a mature/sour starter to use in building a stiff levain/biga to give the dough better mixing tolerance. Great effort there Franko. I especially am liking the image of the dough prior to baking. Very nice touch. I'm looking forward to seeing how this proceeds. Sorry for the late reply but things are a bit crazy (in a good way) around here this week. I'm hoping to take another run at it in the next day or so. David's post on his Altamura bread was quite helpful, as well as all the input I've received on this post, so it's up to me to make good use of it. I've been traveling the Durum, w/madre acida, trail the last few months and have run the same ups and downs as you have. I've settled on a 66% hydration. Recently I've switched from Durum (from KA Flour) to Atta flour ( a new addition to KA's flour line-up). The Atta is more of a whole grain version of the Durum and it's a dollar cheaper per bag. I've found the Durum to be on the sweet side, while the Atta gives a deeper flavor profile. Much the same as subbing whole wheat in a bread recipe. I wonder how refined the Durum flour used in Altamura is? Very good write-up on your part! Well it's good to know I'm not the only one who's run into challenges with this bread. Durum flour does have it's own particular set of characteristics for mixing tolerances and fermentation, that's for sure. It's mainly why I wanted to try this bread, wanting to learn something new, never having worked with a 100% durum dough, and with very limited experience using it in combination with standard wheat flour doughs. Atta durum flour is readily available here in B.C. due to our large Indo-Canadian population. I considered using it as a substitute in the Altamura but decided to try and go as close to what would be used in Italy. Before beginning this project I sent nico/http://www.thefreshloaf.com/user/nicodvb a photo of the extra fancy durum I purchased from Giustos, which he thought looked to be of a slightly finer mill than what is used in his native Italy for Altamura bread. Thanks for your compliments on the writeup. I hope to be able to provide a bit more practical information regarding mixing, fermentation and baking in my next post on this project. Recently I've made pizza ala Reinharts SD version with my Durum/Atta starter. I was pleased with the results. Also you might try adding 500mg of vitamin C (crushed) to the Altamura dough, I find it gives the dough a little more strength. Thanks for posting the links for the videos here and on David's post. Very enjoyable seeing this bread being made, shaped and baked.